Update: with 97% of votes counted, conservative candidate Moshe Lion is leading by 7,800 votes, giving him a lead of over 3%. Barring any last minute surprises, conservative candidate Moshe Lion seems the likely winner of Jerusalem’s runoff municipal election Tuesday. 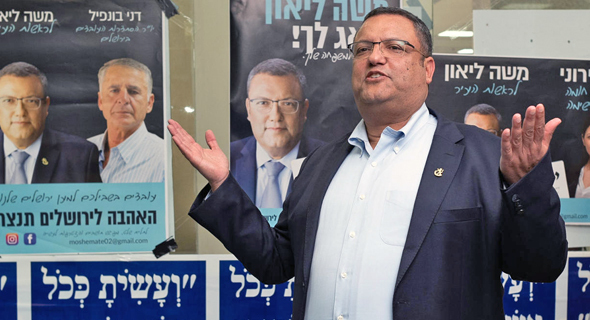 Bolstered by the support of many of Jerusalem’s religious Jewish voters, Lion is expected to defeat his opponent, liberal candidate Ofer Berkovitch. The two went head to head after an earlier three-candidate race failed to produce a clear winner—according to Israeli law, candidates in municipal races must receive at least 40% of the vote to win. Home to Israel’s primary governmental institutions, Jerusalem is the country’s most populous city. According to Israel’s Central Bureau of Statistics, in 2015, the city's population neared 900,000 people, of which 62.6% were Jewish and 37.4% Arab. Also home to religious monuments such as the Dome of the Rock and the Western Wall, Jerusalem houses a large Orthodox population. It is also one of Israel’s poorest cities, often overshadowed by the country’s financial and cultural capital, Tel Aviv. Current Jerusalem Mayor Nir Barkat, a former venture capitalist, focused on bringing new businesses to the city, also dealing with a bout of terror attacks. In March, Barkat announced he would not be seeking a third term as mayor, instead announcing a parliament bid on the Likud party ticket in the next general election. Lion, who ran for the city’s mayorship in 2013 and lost to incumbent mayor Barkat, has served on the Jerusalem city council for the past five years. Two weeks ago, in the election's first round, Lion got 33% of the votes, followed by Berkovitch with 29%. A seasoned political operator, Lion’s ascendency to the mayorship is the highest point of a long, at times questionable, and fruitful political career. Lion’s career is equally characterized by his talent to forge connections with political influencers and by his tendency to become embroiled in criminal offenses and police investigations. To date, his run-ins with the law ended in fines and ransom payments, and acquittance due to lack of evidence. These include a 2013 attempt to smuggle clothes past Israeli customs, for which he was caught and fined $6,771 (NIS 25,000). In the early 1990s, Lion joined the accounting firm Yitzhaki & Co., which had among its clients the right-wing Likud party, Israel’s ruling political party for most of the past 20 years. In 1996, Lion was appointed managing director of the Prime Minister's Office under Benjamin Netanyahu, later becoming the prime minister’s economic adviser. In 2003, Lion was appointed chairman of the Israel Railways, a role he held through 2006. In 2008, he was appointed chairman of the Jerusalem Development Authority, a city agency promoting economic activity. Lion enjoys the support of Israel’s Defense Minister Avigdor Lieberman, leader of the nationalist Yisrael Beiteinu party, and of Aryeh Deri, of the ultra-orthodox party Shas, who is Israel’s Minister of Interior. Lion has not received an endorsement from Prime Minister Benjamin Netanyahu, who half-heartedly supported the losing Likud candidate Ze’ev Elkin in the first round of the election and remained uninvolved in the runoff round.